Jon A. August graduated with a B.A. from the University of Connecticut in 1977 and received his law degree from Loyola University in 1981. He was admitted to the Connecticut bar in the same year. Attorney August concentrates on the representation of injured employees for their workers' compensation claims. He has represented numerous municipal and town police offers and firefighters in their workers' compensation issues as well as pension and retirement issues. Attorney August has written a feature article for the Workers' Compensation Quarterly. He also concentrates on personal injury claims. 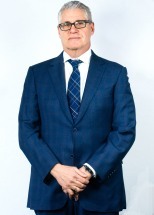 For over 25 years, he has been involved with many motor vehicle accident cases, including a recent 2.5 million dollar verdict on behalf of a young boy. Attorney August has served as a Hearing Officer for the Board of Education of the City of Bridgeport since 1995. In that capacity, he adjudicates issues of student discipline and expulsion. Attorney August also serves as a mediator and arbitrator in multiple personal injury claims.